This old cedar shake cottage, which was probably a livable house at one time, is the perfect place to hang a few nests for mason bees. There are lots of reasons why this might be a great place to produce mason bees. 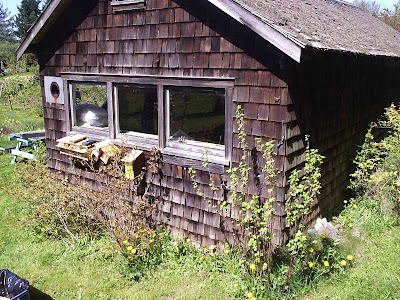 The house itself, provides a place out of the rain with its overhanging roof, the cedar shakes on the sides of the building probably have mason bees amongst the shakes already, it is a warm location, protected from winds by some huge trees, and it is in the sun. Not only is it a warm location in direct sunlight, but the warmth of the shed wall would stay warm long after the sun had gone down. This is important in keeping bee larvae active and feeding. In addition,the owner, has lots of fruit trees and blueberry bushes adjacent to the house providing abundant food sources for the bees. And, most importantly, no pesticides are used on the property.You can imagine my surprise when I produced fewer cocoons in the first season than the number of cocoons I set out. The 3rd and 4th years were no different. The fifth year the bee population exploded. helps the bee in finding its own nesting tunnel. I initially thought some freaky weather pattern made the area cooler and not very attractive to bees. But the 5th year’s explosive growth countered that argument. If production continues to be good, than food and other weather related conditions must be ok for mason bees. My theory now is that during the first few years, there were so many available nesting holes in amongst the cedar shakes and the density of bees so low, only a few nested in the mason bee houses that I had set out. 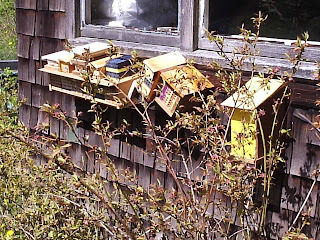 As the years passed, the cedar shake nesting holes filled up and mason bees began to use the mason bee houses in earnest. If this is true, then natural nesting holes will be used first since these are more attractive then most man-made nests. 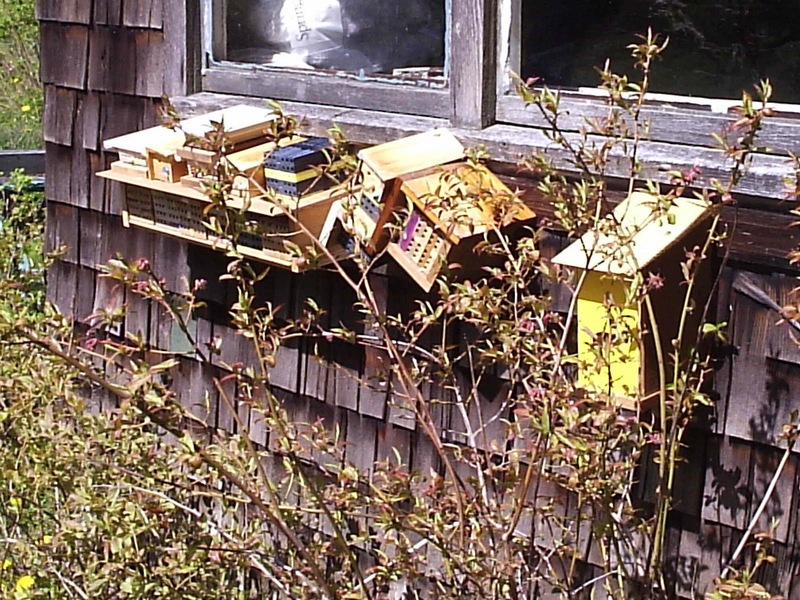 After a few years mason bees will start using mason bee houses. Note: All man-made nests and cocoons were cleaned every fall. Wooden structures were cleaned and scrubbed. Cocoons were washed free of mites, and later candled to identify and destroy any parasitized cocoons. First timer with mason bee houses. I live in a townhouse, and have green on the South and West sides of our place. Is there an optimal height. I conducted a height experiment with mason bees. Their favorite height was 5 feet. The least used height was 2 ft above the ground. All other nest heights were used once their favorite height nests were filled. Coroplast is the trade name for a waterproof plastic material that resembles corrugated cardboard, and is as easy to cut as cardboard with a knife. It is used everywhere for political campaign posters and temporary advertising. The rectangular channels that make up the material are about 3mm wide and 4 mm high. The material is about 3 mm thick, usualy white and translucent. I’m in South Florida. about 26 Deg. North latitude. I anticipate making a box to push several pieces cut to size side by side. I can cut the pieces so the channels angle down. 1) Do I need to block off the back open ends of the channels, or will the bees do that? 2) How deep should the channels be for such small dimension of 3mm wide by 4mm high. 3) Do you think it likely or unlikely a version of mason bee will find Coroplast a good home. Thank You.